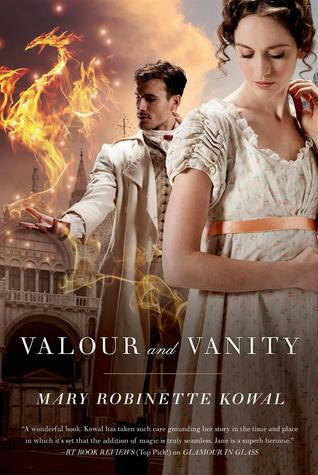 Review: “Valour and Vanity” by Mary Robinette Kowal – Mandaray Reads! Five cups of delicious, fiery tea! This was my first experience with Mary Robinette Kowal’s Glamourist series; and indeed, my first experience with her as an author. I picked up the book on a whim at the library because it contains two things I absolutely love: Relationships in the Regency, era and magic. In fact, as I read the synopsis on the back, I wondered to myself: Why don’t more people experiment with putting magic in historical settings? It’s a fantastic way to add spice to an oft-trod path, as well as reshuffling the social power imbalances of the time. For example, there’s no reason to lock your characters into a dull, painful retelling of sexism & racism when your characters can summon fire and illusions, because we’ve already left “historical accuracy” behind. Needless to say, I was quite excited by the book’s premise. I had also heard good things about Kowal from fellow readers and from folks like John Scalzi, who has spoken highly of her on his blog before. So picking it up was an easy choice. And you know what my favorite thing about this book is? It’s fun. Not the turn-your-brain-off kind of fun, where you know what you’re enjoying is problematic and plot-holed as hell but you feel like you’ve got to go along for the ride anyway, but actual, genuine fun. Valour and Vanity engaged me on all levels, keeping me both entertained and challenged as I read. It was very difficult to put down! The characters were instantly compelling, with deep inner lives and emotions that felt natural and believable. I imagined myself spending time with each of them, soaking in their fantastic stories and conversing with them on a wide variety of topics. Their relationships had an equally enjoyable flow, and at no point did I feel as though I was being told I should idolize or romanticize an abusive marriage/romantic relationship, as so often happens with novels in the historical genre. Better yet, the plot was also sharply intriguing, and actually surprised me in a lot of places! I never thought to expect heists, political intrigue, engineering, and devious planning to happen all in the same book. It was great! Valour and Vanity also has a refreshingly honest depiction of two things way too many authors get wrong: Triggers of past traumas, and depression. I don’t want to go into too much detail for fear of spoilers, but never before have I read a fictional piece where a female character experienced a triggering event in a way that felt natural and real. There weren’t any bizarre hysterics, or sudden fainting, or any other tropes female characters usually get saddled with in order to show how “emotional” they are. Triggers aren’t always obvious or even noticeable to the people around us; especially not if we’re in public, or situations where we don’t feel comfortable expressing ourselves. Jane struggles to regain control of her inner motives just as fiercely as I have in the past; it’s not something she manifests physically until she reaches a breaking point. Later on, Vincent experiences a bout of depression that felt hauntingly familiar. He also doesn’t do what I expect most male protagonists to do in historical-era novels, which is immediately take things out on his wife. While things are clearly tense between them, at no time did I feel as though he was being aggressive, or turning into the emotionless fencepost that so many other male characters turn into when they become depressed. The onus was also never on Jane to “fix” him or to “restore” him somehow; they were his emotions, and he dealt with them in his own time. Both of these things might seem small to some folks; but for me, seeing details like this treated with such respect really meant a lot, and even restored a bit of my faith in the genre. It was refreshing to see, and only added to the fantastic spell this book casts. All in all, I’d say this was an amazing book that I can’t recommend highly enough. I also can’t wait to get my hands on the rest of the series! This entry was posted in Book Reviews and tagged fantasy, five star rating, Glamourist Histories, heist novel, magic, Mary Robinette Kowal, Regency era, romance, Valour and Vanity. Bookmark the permalink. Pingback: Review: “Of Noble Family” by Mary Robinette Kowal | Mandaray Reads!